MD/MS - Obstetrics and Gynaecology, M.B.B.S. Dr. Bhavna Agarwal, M.B.B.S,M.S. (Obstetrics & Gynaecology) is a consultant Gynaecologist at Mukat Hospital, Chandigarh. Prior to joining Mukat Hopsital, she has worked at Sir Ganga Ram Hospital, New Delhi and was a consultant at Sohana Hospital, Mohali. She completed her basic medical studies (M.B.B.S) from the prestigious King George’s Medical College, Lucknow. Thereafter, she completed her post graduation in Obstetrics and Gynaecology from GSVM Medical college, Kanpur. Subsequently, she worked as a resident at the Guru Teg Bahdar Hospital, New Delhi. She has attained a fellowship in Minimally access surgeries. 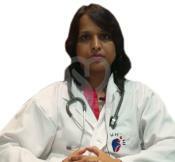 Apart from this, she has achieved training in advanced reproductive medicine from Surat, Gujarat. Dr. Bhawna has successfully treated patients suffering from fibroids, ovarian cysts, ectopic pregnancy & endometrial polyps.